Its the end of the fourth quarter, youre down by a 10 bull gill but there is not much time left on the clock. Luckily oxygen levels have increased, plankton blooms are now large, and even without much for living weeds the shallows are alive with life again. The mid- winter doldrums are behind us and due to the increase in oxygen levels, aggression levels are high. 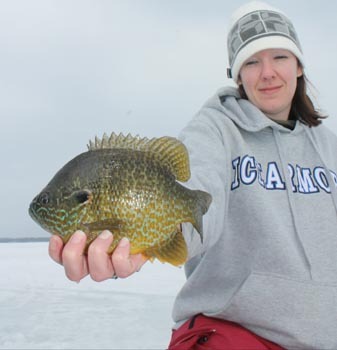 The lake accesses are now usually empty as many anglers have put ice fishing gear away in anticipation for the first open water adventures of the year. Here are some tips to help you hit that last season winning bluegill at the buzzer. When scouting new water at late ice focus on the northern end of lakes. This area is receiving the most sunlight penetration and will have the largest plankton blooms starting the food chain. Some of my favorite areas to look are shallow flats adjacent to black bottom bays. Unlike during mid-winter healthy weeds are not necessary to hold fish shallow this time of year. If you do find living cabbage or coontail in these areas you will most certainly experience some spectacular fishing. If the shallow flats are void of life start following the most direct routes to deep water on your lake map. You may have showed up shallow before the fish. Use the process of elimination to continue your search. Anglers that fish memories can have good outings and bad outings. An angler with a strong process of striking out and finding fish by eliminating unproductive water and working through seasonal migrations will succeed more often than not. Doing things like finding warmer water, pinpointing spawning and black bottom feeding bays, looking for green weeds with an underwater camera, and drawing some direct routes to deep water near these areas will lead you to late season success. Fishing in the extreme shallows successfully requires a certain level of stealth. When searching for giant bluegills I will often drill holes before the sun rises. Another great advancement for fishing the shallows has been the drill auger. My K-Drill, from Ice Fishing Today, hooks up to a cordless drill and allows me to be quiet and continue to make moves throughout the day. The entire set up weighs only ten pounds and rips through about one inch of ice per second. If moving through the frozen tundra with the speed and stealth of an arctic ninja is your goal, give the drill augers a try. Try to limit any additional noise when searching for shallow bulls. Last year on a late ice adventure, I was sitting in my Clam carefully working two giant bluegills for what seemed like an eternity. All of a sudden both fish scattered just seconds before my fishing partner showed up at my window to ask how the fishing was. We were both somewhat surprised how simple footsteps would spook these fish through over twenty inches of ice. We did however learn an important lesson on limiting whatever noise possible when fishing shallow water. 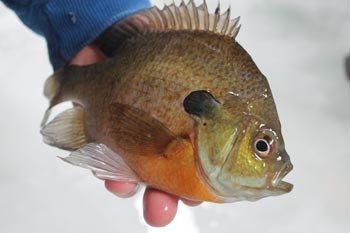 Bluegills often have certain routes they follow to escape predation and to feed. A few feet can make a big difference. Remember the old adage that big moves find fish and small moves catch fish. Once Ive located some shallow late ice giants, I will make a series of micro moves often moving only 5-10 ft. You will be surprised how much this will increase your success rate. For instance last year on a late ice adventure we had located a patch of green cabbage that came right up to the surface. We found bluegills stacked up in the holes directly surrounding the large cabbage patch. Ten feet away on the drop off leading to deeper water we found the crappies. I fished a tournament on Lake Okoboji in Iowa a few years ago and watched winning bags of fish come from specific feeding lanes when anglers only feet away didnt have a fish in their bucket. While making small moves and sight fishing will teach you a lot about their movements, a camera will shorten the learning curve exponentially. In extreme shallow water the cone angle on your flasher becomes very narrow thus limiting your information to right before fish are in your line of vision. A camera can be quickly deployed, turned, and then picked up and brought over to the next hole. This will provide great information on where to move next. It will show you fish, condition of remaining weeds, bottom composition and sometimes even the food source. When Im in search mode at late ice, I typically set out with a heavier rod and some bigger baits. I simply want to locate fish. Once located you can then figure out what it takes to get bit on that particular day and downsize to small tungsten and light rods. The problem with searching while using micro presentations is that it often wastes time. While in search mode you want something that will get down to the fish quick and show up from a long distance away. When fishing shallow electronics dont often tell the entire story so spending a few moments at each hole may uncover what youre looking for. One particular search bait that has produced fantastic results for me these past few seasons is the Northland Tungsten Silver Spoon. The compact design and small hook on this bait makes it a panfish favorite. Pair this with the flash and vibration that this spoon offers and you have the perfect search set up. The days are growing longer and getting warmer, soon late ice will be upon us. Quick fishing trips after work are now an option. Many days you may have the lake to yourself. 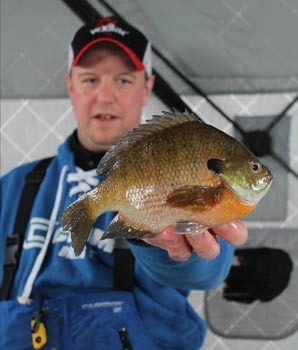 While many may choose to spend the days preparing their boats for warmer days ahead this writer longs for a few more meals of skin on bluegill fillets. Be safe and dont miss some of the great opportunities left in this hard water season. The author Garett Svir is the owner of Slab Seeker Guide Service and specializes in pursuing trophy bluegills. You agree that you are the original author of each article or story that you submit. If you have hired a ghostwriter, then you have already agreed that you have exclusive rights to each article or story you submit. There are no guarantees that your article or story will be accepted for publication in My Fishing Pals. It is at the sole discretion of My Fishing Pals whether or not to include your article or story. If published, we reserve the right to remove any article at any time. Publish your fishing article on My Fishing Pals. Publish your fishing article in News Feeds. Publish your fishing article to other Websites in promoting My Fishing Pals. You agree that My Fishing Pals is a free service for authors and publishers. You will not be paid for submitting your article or story to our site and you will not be paid if and when your articles or stories are published. You will receive all credit for your work and your name and other pertinent information will be displayed. We reserve the right to include advertising on pages with your articles. An angler is a man who spends rainy days sitting around on the muddy banks of rivers doing nothing because his wife won't let him do it at home.